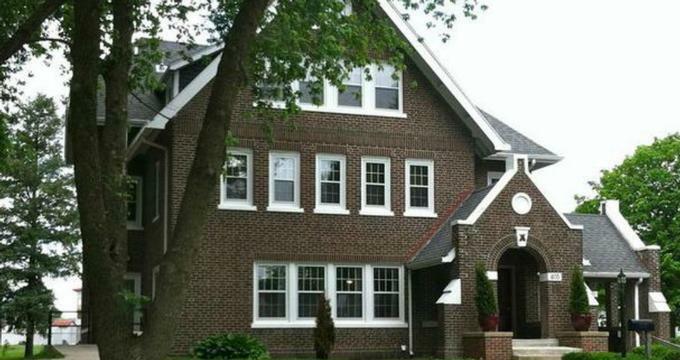 Built in 1924 as the ‘Sigma Sigma Delta Chi’ fraternity house and expertly transformed into a charming 15-room hotel, Iowa House is an inviting abode on Hayward Avenue in Ames that offers a comfortable home-away-from-home getaway. Ideally situated within walking distance of the central campus of the Iowa State University, along with the Iowa State Center, the Memorial Union, the Hilton Coliseum, and plenty of restaurants, shops, cafés, and bars. Listed on the National Register of Historic Places, the Iowa House features beautifully appointed guest rooms and suites with country-style décor and antique furnishings, private bathrooms with whirlpool tubs, and modern amenities such as flat-screen televisions with cable channels, mini-fridges, and microwaves. Additional amenities at the hotel include a complimentary breakfast served every morning, free off-street parking, and complimentary wireless Internet around the property. Iowa House features 15 well-appointed and comfortably decorated guest rooms and suites with country-style décor and antique furnishings. Three bedrooms are located on the lowest level of the house, six rooms on the second floor, and six rooms on the third floor, all of which have king or queen-size pillow-beds dressed in high-quality linens, down comforters, and plush pillows, and en-suite bathrooms with showers and whirlpool tubs, single vanities, fresh towels, and branded bath products. Modern amenities in both guest rooms and suites include flat-screen televisions with cable channels, coffee makers, fridges, microwaves, telephones, irons and ironing boards, hairdryers, and complimentary wireless Internet. Iowa House offers amenities, facilities, and guest services such as spacious communal areas such as a living and dining room and a former fraternity Chapter Room where guests can relax over a game of cards, games, puzzles or watch a big game. This space is also equipped for business meetings with audiovisual equipment for powerpoint presentations and slideshows. Other amenities include a complimentary breakfast served in the dining room every morning, free off-street parking, and complimentary wireless Internet around the property. The delightful town of Ames in Iowa offers much to see and do in the way of attractions and activities, including arts and cultural events, entertainment and outdoor pursuits. Attractions in the town and surrounding area include the beautifully landscaped Brookside Park with its picnic shelters and tables, grill spots, volleyball, basketball, and tennis courts, and baseball diamonds; the Brunnier Art Museum; the 200-acre McFarland Park; and the beautifully landscaped Reiman Gardens. Don’t miss a visit to the four-museums-in-one Boone County Historical Society, the Stephens Auditorium, the Octagon Center for Arts, the Textile and Clothing Museum, and the Torrent Brewing Company. Iowa House is an ideal venue for social and corporate gatherings such as weddings and family gatherings, fraternity reunions, and professional seminars and retreats. The Chapter room and the dining room are equipped for meetings and business gatherings with state-of-the-art audio-visual equipment for slide shows or powerpoint presentations, and other services include award-winning catering for lunch and breaks, comfortable accommodations, and upscale amenities.